The mourning dove is one of the most abundant bird species in North America and dove populations have been stable for the past 10 years. Population estimates are derived from leg-banding studies and breeding bird surveys conducted in Virginia and throughout the country. Data from recent years indicate there are around 267 million doves in the United States and around 6.6 million in Virginia. 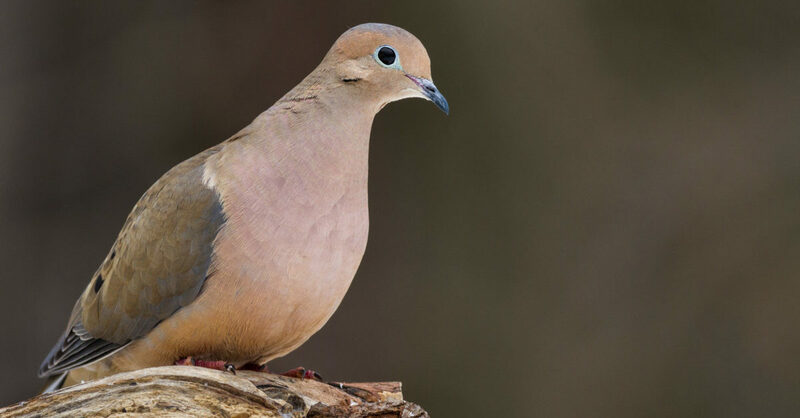 Mourning dove hunting is very popular and is offered in 40 U.S. States and several Canadian provinces. In the United States, an estimated 810,000 dove hunters take an annual harvest of around 13 million doves. Recent surveys in Virginia indicate there are around 16,600 dove hunters in the state and the average harvest is around 223,000 doves annually. In 2018, the late winter and early spring weather was cool and damp, with many areas getting above average rainfall. These conditions sometimes lead to a reduction in dove nesting success. Doves build fairly shallow nests that can get damaged by wet and windy conditions. In addition, the nestlings are susceptible to this cool and wet weather, and their survival is often lower in these conditions. So, some of the early dove nesting was likely hampered by these conditions. However, the weather improved over the summer and production appeared to be better during the latter portion of the summer. The summer trapping and leg-banding efforts being conducted by the department have captured good number of young doves in the western portion of the state, but below average numbers of young in the east. Overall, production looks like it will be below average this year. Dove hunter success often depends not only on the dove population and nesting success, but also on the condition of the habitat and the amount of food available. Like always, conditions varied around the state. In many areas, planting dates for agricultural crops (corn and sunflower) were delayed by the wet weather, and some early plantings were flooded out. Other areas, however, appeared to be about average. Continued moisture throughout the summer has led to a good crop of both native vegetation and agricultural grains in most of the state. Recent wet weather at the time of this writing (late August), along with the initial delay in planting dates, is delaying the corn harvest in some areas, although some cutting for silage has already begun. As the corn harvest increases in early to mid-September, this will open up more feeding grounds for doves. However, this may also spread the birds out across the available habitat, and make concentrations of birds harder to find. Some pre-season scouting may be necessary to help locate areas that doves are using. Look for fresh cut agricultural fields or areas with lots of native plant foods. Remember to check your birds to see if any are wearing leg-bands. The Department captures and leg-bands doves in July and August, just prior to the hunting season. The information obtained from this banding program is used for evaluating dove population status and for developing hunting season regulations. Only about 5-10% of the doves we band are recovered by hunters, and most of those recoveries (90%) occur with-in the state of Virginia. Out of state recoveries of Virginia-banded doves have come predominantly from states along the southeastern U.S., including MD, NC, SC, GA, and a couple from Florida. Most band recoveries occur during the first two weeks of the season, and 90% of all recoveries occur during the month of September, an indication that most dove hunting occurs during September. Remember to report any bands you recover to the Bird Banding Laboratory website – www.reportband.gov. You will receive a “Certificate of Appreciation” that includes information on where and when the dove was banded. Also, remember to register for HIP well before going dove hunting so you aren’t rushed trying to do everything at the last minute. Enjoy your hunting and be safe. Good luck!